Swedish lightheavy Oscar "Golden Boy" Ahlin, 8-0 (8), takes on tough Italy-based Ukrainian Sergey Demchenko, 14-5, Oct 17 in Kolding (Denmark). Ahlin (pictured) is currently in Berlin for some sparring but will return to Stockholm for final preparations in a week. 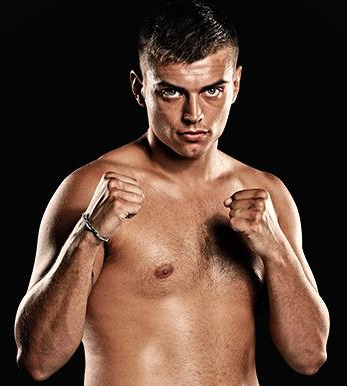 Ahlin´s knockout streak makes him currently number three in Swedish history with now retired heavyweight Attila Levin on top with eleven early endings (from career beginning). Milan Mirkovic is # 2 with nine early endings to his credit - Mirkovic was during his career trained by Oscar´s father Torsten, in his day a good amateur boxer, who at 55 turned pro in Estonia for a few profights. IBF I/C lightheavy champ Robert Woge, 12-0, defends the title against Ukrainan Anatoliy Dudchenko, 18-2, October 26 in Oldenburg. This will be the fourth scheduled titlefight on the bill that is topped by Arthur Abraham vs Giovanni De Carolis. In other action Jack Culcay face Guido Nicolas Pitto for the WBA I/C 154 lb title and EU middleweight champ Marcos Nader defending the title against Spaniard Luis Crespo. Promosport Sardegna will stage the fight for the vacant EBU flyweight title between Valery Yanchy and Andrea Sarritzu October 26 in Cagliari. Yanchy vs Sarritzu was first tentatively set for a September date. Mohamed Ali Ndiaye and Christopher Rebrasse clash again for the vacant EBU supermiddle title on November 30 with site to be announced and with purse offer winner OPI 2000 promoting the fight. The first fight between these two ended in a draw but all reports indicate a clear win for Rebrasse except for on two of the three judges' cards. EBU welter champ Leonard Bundu take on veteran Gianluca Branco December 21 at a venue to be announced. OPI 2000 promotes the fight. P 3 Boxing in Finland have WBA I/C lightweight champ Edis Tatli headlining its next show which will staged in December with exact date and site to be announced. Simon won the vacant IBF Int´l title on scores of 117-111 twice and 116-113. Boschiero retained the EBU superfeather title on scores of 117-111 twice and 117-112. Guerfi won the EBU bantam title on scores of 116-112, 115-113 and 113-113. Alexandru Jur, 82,2, Bel W 4 Jorge Ortiz, 79,0, Col/? All winners plus Jamoye and Slimani represent GMG. 10-9 for Aleksejevs after the first. Mundo Hispano lightweight title, scored 96-94 and 96-95 for Daluz and 97-93 for Gago. espabox.com had 96-94 Daluz. Italian superwelter title, scored 98-92, 97-93 and 97-94. Corley lost all four completed rounds but wasn´t in trouble. He then retired himself and didn´t come out for the fifth. Jomardashvili, overweight and looking sloppy, was down in the second and had a point deducted as well for not obeying the referee. Jomardashvili, more tired than hurt, was floored in the third and made sure he made it up in time for the fight to be stopped but still could protest. Licina was in shape though and can still be a force at cruiser. Kahl, still on the EBU suspension list, goes down twice with the second knockdown semi-genuine and was counted out in the act of rising.